"I try to evoke what Zen practitioners call nothing and everything, the sense of being one with the universe." Amy Cheng fluidly merges western painterly preoccupations with the eastern sensibilities of her heritage. Born in Taiwan, and raised in Brazil, Oklahoma and Texas, Cheng has developed a painting vocabulary based in various cultures that remains uniquely her own. Her oil works often rely on repeated pattern, brilliant color and an intricate layering of space. 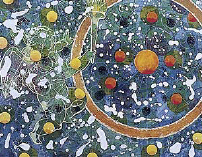 Her most recent works, while abstract, still provide visual references to planets and stars, fabrics and maps.